Read, Write, Love at the Seaside is the ultimate, opposites attract sweet romance! On the one side you have the OCD writer Kurt Remington; stuck in his ways and not willing to change! And on the other side you have the sweet, free-spirited Leanna Bray, whom can't control her dog, nor manages to be on time…for pretty much anything! I a side not, I wrote that with a wrestling announcers voice in my head…so, apologies for that. 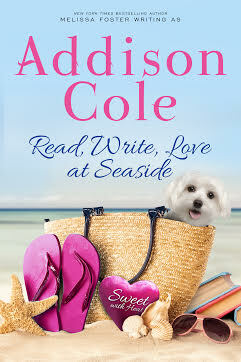 Read, Write, Love at the Seaside is the first book in the Seaside Summers series by Addison Cole, its sweet and funny, heartwarming and refreshing, and quite frankly, I wanted to live in the book! The whole story is divine and I didn't want to put it down! I honestly cannot separate anything about this book! It is simply divine! Beautifully written….and I could go on and on about how much I loved it! But I truly did with my whole heart! Which is why I'm waiting for the paperback to be delivered! I give Read, Write, Love at the Seaside 5 stars!